Hearing loss is caused by blockage or damage to a part or several parts of the auditory or hearing system. In order to better understand hearing loss, it is important to know the general anatomy of the ear and the neural pathways that run from the brain to the ear. The auditory system is made of four basic parts: the outer, middle, inner ear, and the auditory neural pathways. serves primarily to direct or funnel sound towards the ear drum. It consists of the pinna (the part of the ear that we see) and the ear canal. is responsible for further conducting sound. 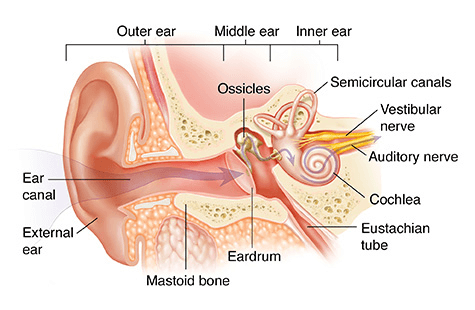 The middle ear consists of the tympanic membrane (commonly referred to as the ear drum) and three small bones called the malleus, incus, and stapes. These are the smallest bones in the human body. is responsible for turning sound into neural impulses. The inner ear structure important for hearing is the cochlea. The cochlea is a fluid filled structure which contains thousands of cells called hair cells. These are called hair cells because these cells have microscopic structures called cilia which resemble hairs. These hair cells are connected to nerve fibers which make up the auditory nerve. When these hair cells are activated by sound, they stimulate the nerve fibers. is made of various structures including the auditory nerve, structures within the brainstem, and the auditory cortex in the brain. Once sound has been turned into neural impulses, these neural signals travel up a complex pathway until they arrive at the brain where all these neural impulses culminate in a sound that one can perceive. sensorineural loss, conductive hearing loss, and mixed hearing loss. A problem with the Eustachian tube, which equalizes pressure in the middle ear space. For some individuals with conductive hearing loss that cannot be treated effectively with surgery or medicine, hearing aids may be an appropriate treatment. As you might expect, mixed hearing loss is a combination of damage to the outer or middle ear as well as damage to the inner ear. These two forms of damage may take place at the same time, particularly when there is a serious injury. In other cases, one may experience sensorineural hearing loss due to aging, which is then exacerbated by one of the causes of conductive hearing loss, such as an infection or foreign object in the ear canal. The causes of mixed hearing loss include any combination of the causes of conductive and sensorineural hearing loss. It is important to understand the type of hearing loss in order to properly diagnose the condition and find possible treatment solutions. Specifically, conductive hearing loss may be cured through surgery or medicine that changes the function of the outer or middle ear. On the other hand, surgery and medicine are ineffective in treating sensorineural or the sensorineural component of mixed hearing loss. In those cases, hearing aids are the best option. Hearing aids will amplify sound in order to provide a more robust signal to the auditory system. In any treatment for hearing loss, the goal is to provide the strongest and clearest signal from the external word to the ultimate point of reception in the brain. If you believe you are experiencing hearing loss, contact us at Elite Hearing Center today to schedule a hearing test and consultation.